Darryl has been doing handy projects all of his life. Learning electrical work from his father, he enjoys installing light fixtures and outlets. He has been on numerous mission trips rebuilding homes and churches. 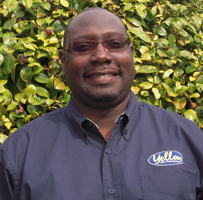 Darryl has a passion for people and is committed to customer service. He loves spending time with his wife and kids and coaching track and field at the local high school. For me, a big part of living life to its fullest is being able to be flexible enough to help my members out as well as still be able to do the other things that I love too such as spending time with my wife and children, coaching track and field and preaching at the church I am planting. Because I am able to set my own hours, I am able to be flexible with my members and work with their schedule. In addition to being a franchise owner with Yellow Van Handyman, I am also the pastor at a brand new church plant and my family and I are starting up. I am excited to add my new handyman business to my growing resume. Because I’m going to be working on my member’s biggest investment, their home, I want my members to see good service with a touch of love. I want them to feel completely comfortable with my work and I want them to be 100% satisfied. As the owner and operator of the business, I am able to give this to my members. While I can and will do just about any task that is presented to me, I especially enjoy electrical work. I love installing new lighting fixtures and brightening up the rooms that I install them in. New lighting fixtures can totally change the look and feel of a room and provide an instant face lift. Because I am a jack of all trades, your home will be in great and loving hands. So whether your service is needed on the interior or exterior of the home, I can do the job! My most common request is installing appliances. I also am asked to do quite a bit of drywall repair as well as minor plumbing repairs. The most unusual request I have received was to install a window air conditioner through a cement wall. To me the biggest form of flattery is when my members refer me to their friends or family. It’s such an honor to know that I provided such excellent service that they wanted their family and friends to experience the same great service. Darryl was amazing! Will use him again for sure! Darryl Hammock was thorough and results-oriented. He was very knowledgeable and professional. A great all-around experience. The handyman, Darryl Hammock, did a great job on installing sinks and faucets in 3 bathrooms and a faucet in our kitchen sink. He was friendly and knowledgeable. I will use his services again in the future. Darryl was very professional, knowledgeable, and service-oriented. He came up with several options and alternatives at different cost points, which I appreciated. I would whole-heartedly recommend him for any handyman services. Every request was handled very professionally. This the 2nd time I have called Darrel to install a door. I would call him again and highly recommend him. Darryl arrived on time, pin-pointed the problem promptly and resolved the issue quickly, and was on his way! Without hesitation, I would certainly use Yellow Van Services again. Thanks very much!